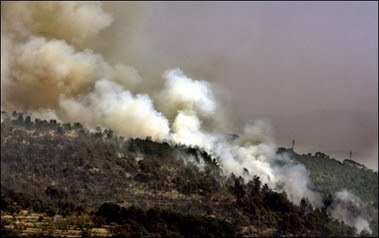 The Syrians are being blamed for the fires raging in Lebanon. About 85 fires started on Tuesday and more than a 100 on Monday, the head of the Lebanese Civil Defense, Brigadier General Darwish Hobeika, told The Daily Star. Hobeika added that investigations were under way to determine whether the fires had been set intentionally. “It’s a 95 percent possibility that the fires were caused intentionally by people trying to obtain charcoal as a cheaper substitute for fuel,” Hobeika said. 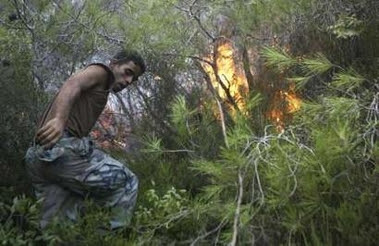 An estimated 3,400,000 square meters of woodland were destroyed by fires in the Chouf region and around 200,000 square meters in the North. Hobeika said almost 80 percent of fires had been contained but blazes still raged in the Northern town of Andaqt. Meanwhile… Senior parliamentarian Walid Jumblatt is pleading for help from the international community.